The scene: Miss Eyre's students are writing essays on Othello. Miss Eyre is helping a student we'll call Brandy revise her essay. 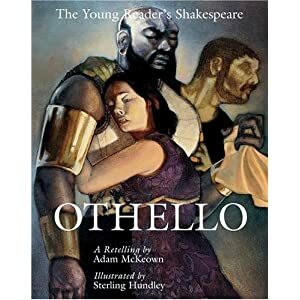 BRANDY [in essay]: Othello, a Native American, was a great Venusian general. MISS EYRE [to Brandy]: So, Brandy, I didn't know Othello was Native American. MISS EYRE: Um, no. He was a Moor. BRANDY: Oh. So he was African-American. 'Cause Moor is black, right? MISS EYRE: Well, kind of. But this play dates from the seventeenth century. So there was no America. BRANDY: Oh! So I should just put that he was a Moor? MISS EYRE: Yes. That will work. Also, you might want to rethink your spelling of "Venetian." That's the term you mean for someone from Venice. MISS EYRE: Well, you spelled it "Venusian." That means he's from Venus. Like the planet. BRANDY: Oh! Right. [giggles] Oh, miss, you know I didn't mean that. MISS EYRE [to herself]: I sure hope not, or my teaching of Othello was more confusing than I thought.